Iraqi Kurdish Regional President Massoud Barzani (R) meets with Turkish Foreign Minister Feridun Sinirlioglu (L) in Irbil, Iraq, Nov. 4, 2015. The first visit out of the country by Turkey’s foreign minister following the AK party's election victory was to neighboring Iraqi Kurdistan. The visit was seen as part of Ankara's efforts to secure the support of Iraqi Kurds in its battle against the PKK Kurdish rebel group and its affiliate in Syria, the PYD. After meeting with Iraqi Kurdistan leaders, Turkey’s foreign minister, Feridun Sinirlioglu, said in a statement that both sides needed to cooperate, especially in the fight against terror. For many years, Turkey’s ruling AKP has had close political ties with Masoud Barzani, president of the Iraqi Kurdish regional government. Semih Idiz, a political columnist for Turkey’s Cumhuriyet newspaper, said the AKP, buoyed by its election victory, has committed to intensifying the war against the PKK, and sees the Iraqi Kurds playing an important role. "In the mid-90's, [the] Barzani group did actively fight the PKK, on the basis of an agreement that was signed in Ankara; but I think the after taste of that period still lingers on and I don't think they want to return to that," said Idiz. "There is a cultural stigma attached to Kurds who cooperate with Turkish security forces against other Kurds. Barzani may restrict PKK activities in the cities," Idiz said. 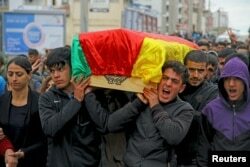 Mourners carry coffin of Yakup Sinbag, a civilian who was killed during the clashes between Turkish security forces and Kurdish militants, in Silvan in the southeastern Diyarbakir province, Turkey, Nov. 10, 2015. Observers say the PKK, which has many bases in the Iraqi Kurdish region, enjoys significant local support, especially after defending the region against the Islamic State group. Columnist Idiz says Ankara may be looking to the Iraqi Kurdish forces known as the Peshmerga to challenge fighters of the Kurdish PYD in neighboring Syria, which it accuses of being a PKK affiliate. "This is very much a possibility, which reduces the importance on the ground of the PYD," said Idiz. "And there are also reports that Peshmerga have been receiving training in Turkey." Ankara says it will not allow the PYD to make further gains against the Islamic State group along its Syrian border. Barzani has made little secret of his concern over the PYD's dominance over Syrian Kurds. Analysts say Ankara could well be looking to use those tensions to deepen its alliance with the Iraqi Kurdish leader.